Much like I did with the living room mantel I shared last week, I went with what I consider to be traditional fall colors, but in more muted and slightly toned down shades. 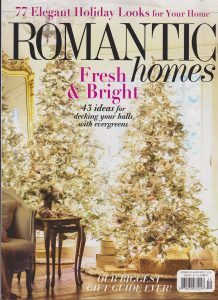 I love that the colors make the house feel cozy and warm, yet they are subtle enough to work in my mostly neutral house. As I shared last week, I’m completely crushing on copper! Here I added a mercury copper pumpkin. 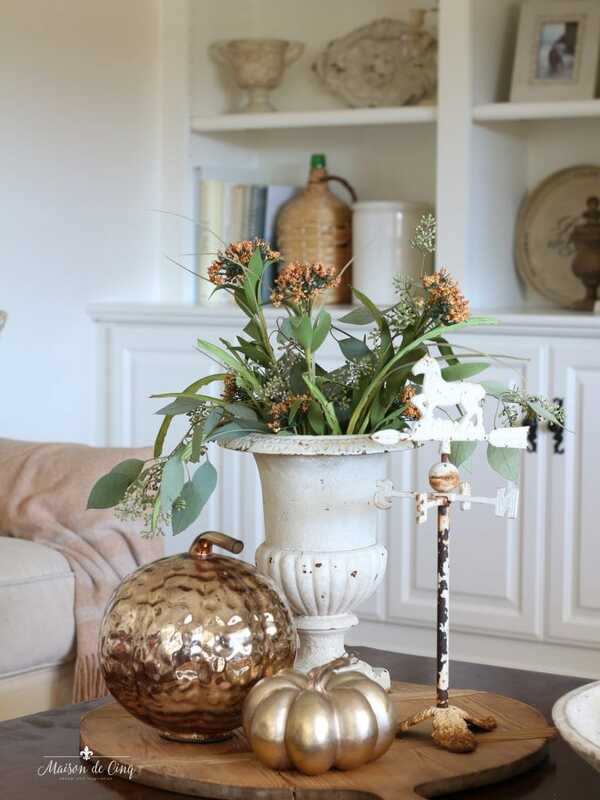 And the little copper plant mister is vintage – I was so excited when I found it! 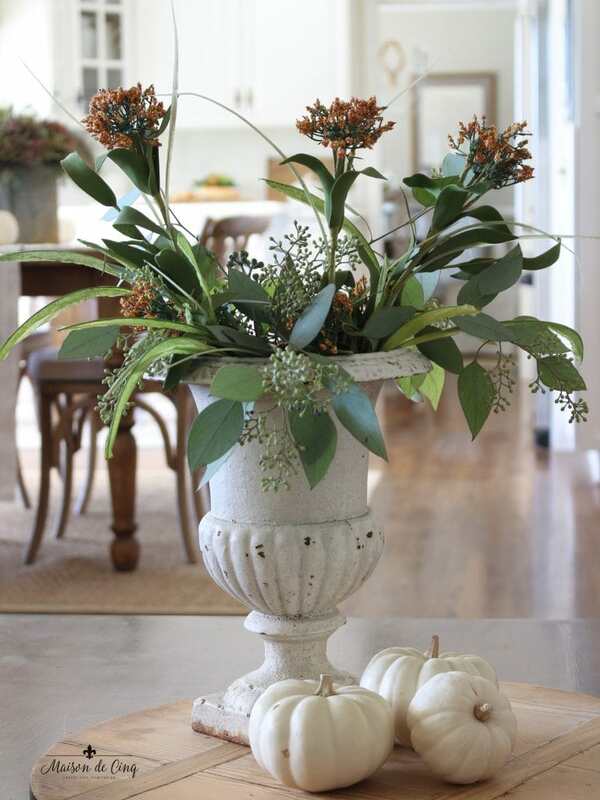 Flowers in autumnal colors sit on the coffee table in a vintage French urn. 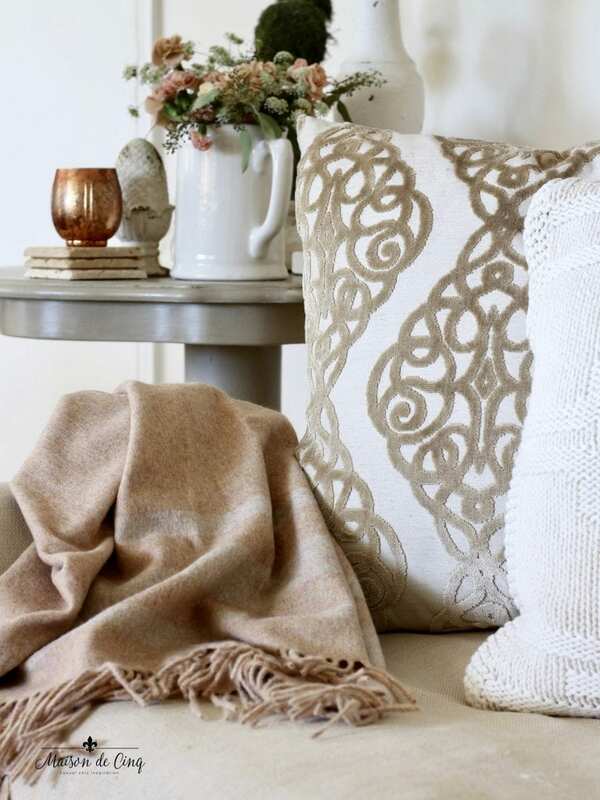 It’s nice to add some cozy texture when fall and winter roll around. 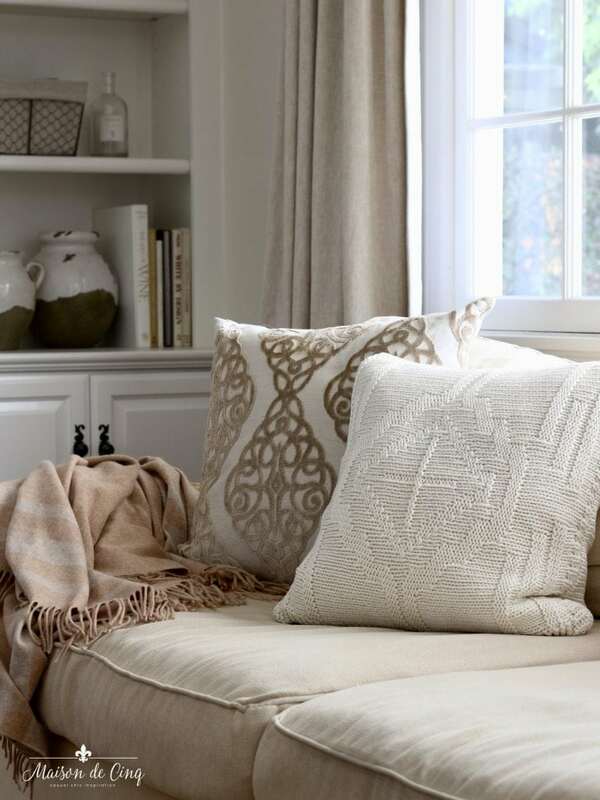 This faded wool throw is perfect for adding those muted colors I’m loving right now. 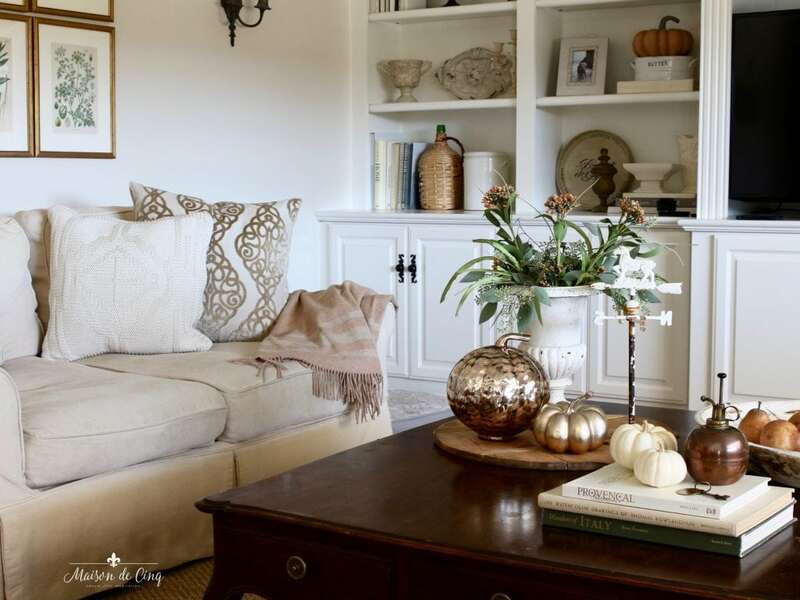 I also moved my living room pillows in here (the pillows that were here were green florals) creating more of a neutral vibe for all the autumn colors to work off of. 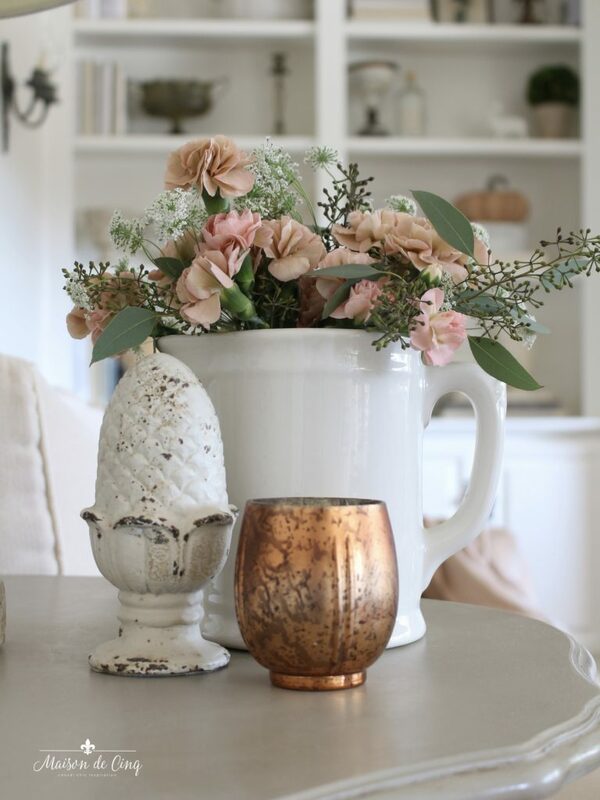 I talked about these copper votives last week – I am so smitten with them! They are from Pottery Barn and come in lots of shapes and sizes! I could not resist the them….aren’t they so perfect for fall?! The kitchen table looks right into our family room so really it’s one large space. Lush fall colored hydrangeas in a rusty bucket along with some small white pumpkins created the simple table look. These fading hydrangeas are one of my absolute favorite flowers! And they just say “fall” to me 🙂 Runner is a vintage grain sack. The sweater pillow adds more of the cozy factor. Now that I have the living room pillows in here, I’m not sure I’m going back to the green ones! 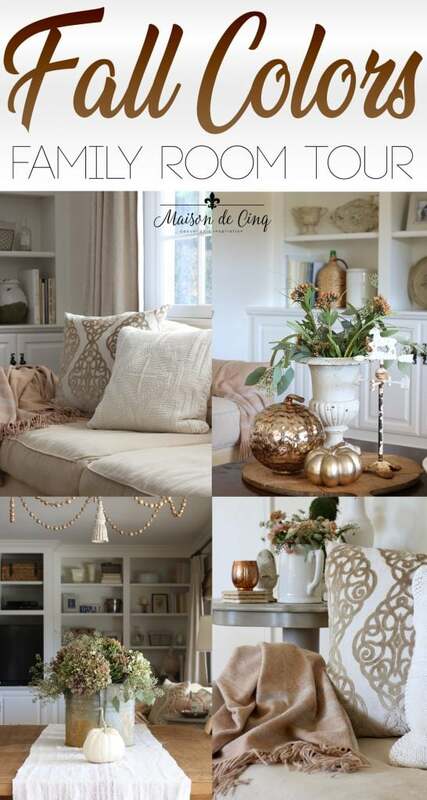 I love the softer look it gives the room, and I’m not so locked into a color when decorating. 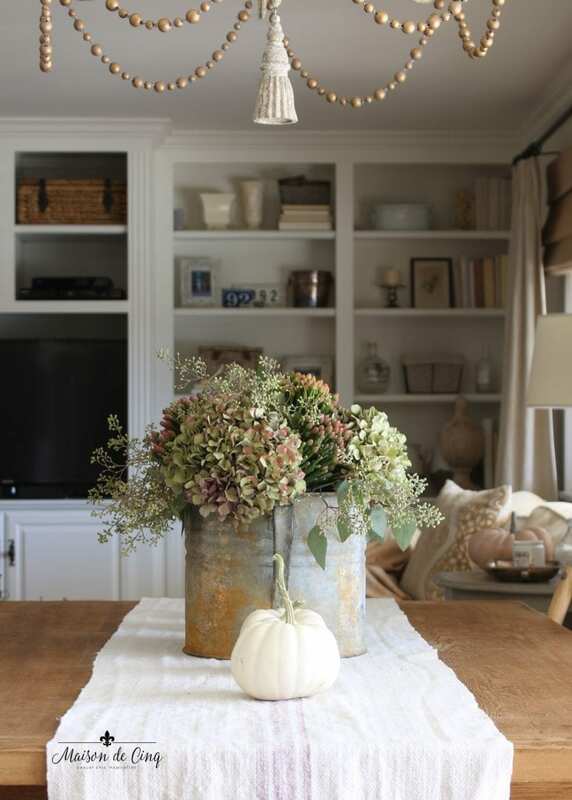 I hope you enjoyed my fall family room, and that it got you excited to decorate for fall! Whether you go for bold, traditional colors, or enjoy a more neutral look (like I did last year), either way putting out a little bit of decor definitely adds something to the season. Decorating for these tours definitely gets me more excited for the change of seasons, and makes me appreciate all the different, wonderful things that each season holds. I even started baking some pumpkin bread this past week! 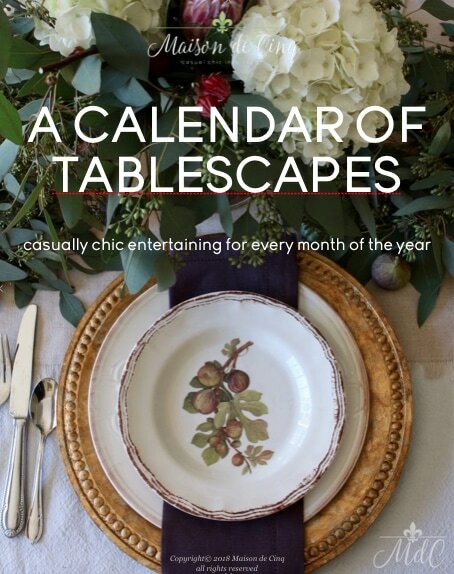 Be sure to scroll down and check out all the talented bloggers also sharing today. 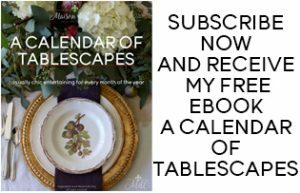 I know you’ll find some inspiration as they are all amazing! Thank you so much for your sweet comment -and for stopping by! schroll pillow on sofa was purchased. Hi Anne, thanks so much for reaching out! the throw and the pillow were both from Home Goods last year. I did link several similar items in the post, but I couldn’t find the exact same thing. Sorry, I wish I could be of more help! I love your style. Everything looks so beautiful. I especially like your drapes. Can you tell me what they are made of and where you bought them? Thanks in advance. Hi and thanks so much for your kind words! My drapes were custom made but they are made of a pretty simple oatmeal colored linen.Very close to the RH ones, actually. Hope that helps! I love the softness and the feel of your autumn touches. I know I have sweater pillows tucked away somewhere-great idea to bring them out this time of year. Always love everything you do. Such lovely fall touches. Was the soft brown throw your jumping off point? 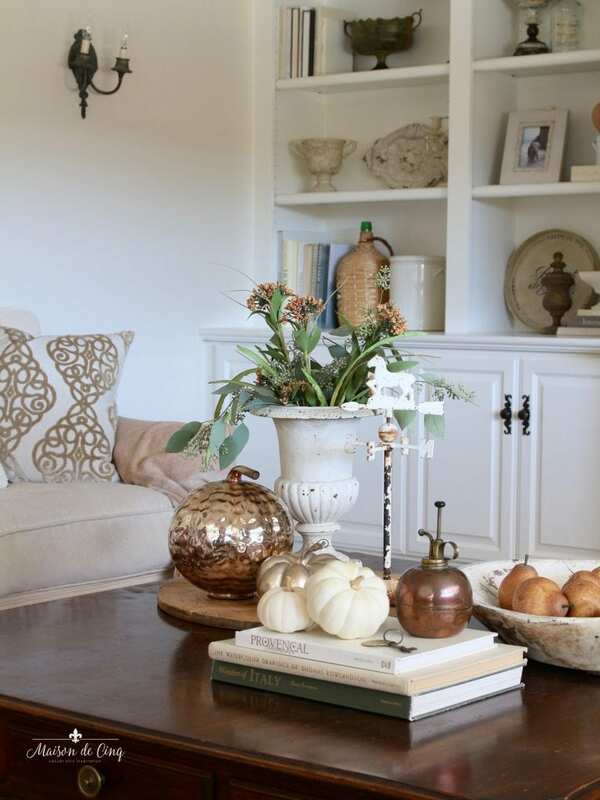 Whatever was, the pillows and throw are perfect together and the copper adds a quiet touch of shine. I’ve been on the hunt for the perfect mister for decor. I don’t care if it’s antique or a reproduction. Yours is a beauty! Thanks so much for your sweet comment! My jumping off point originally was actually the antique hydrangeas and all those muted colors! But then the very first thing I bought was that throw, actually! Good luck finding the perfect mister!! Loving all your pops of copper, and your muted tones for fall!! So soothing and pretty 🙂 Your fall flowers are just SO beautiful! Thanks so much Bre – that is so sweet!